My Jockey Box DIY project has been a very popular post, so I want to take this opportunity to update it with the latest version. You can see the original post here to see what a jockey is and what I did originally. I’m not going to dribble on because I know your just here for the nitty gritty. For this upgrade I’m going to be replacing the 25′ of food grade tubing with an Aluminum cold plate and adding pass through shanks. First, you’ll need to assemble the cold plate. They do not come assembled. For each line, add the Cold Plate Flare Washer into each hole. Then for each Cold plate fitting wrap a bit of Teflon tape around the end, just enough to wrap around with a bit of overlap and screw into the hole with your adjustable wrench. If you have never used teflon tape, basically wrap in the same direction as you will screw on the female end. The fitting with the 5/16 (the bigger of the two) screws in to the “In” line, the 1/4″ barbed Fitting screws in to the out line. Make sure you tighten them well, the last thing you want is beer leaking in your cooler where you won’t see it until it is to late. 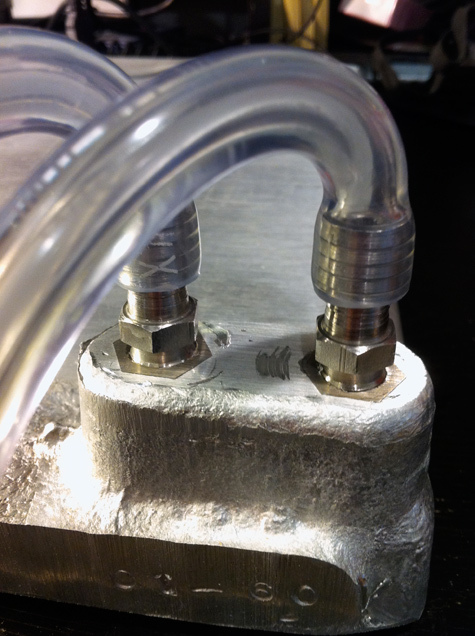 After you have the barbs attached to the cold plate, The you should attach the tubing to the barbs before putting the plate. You’ll want to measure the distance to where the shanks will go out of the cooler and to the tap shanks, this is how long each piece should be. The Beer Line will not fit easily on the 5/16 barbs. To make them fit, soak the ends of the beer line in some boiling water. This will loosen/soften the tubing enough so you can wiggle it onto the barb. With my cooler, I’m upgrading the cooler from pvc tubing to a cold plate, so I already had holes in the cooler since I didn’t use shanks the first time to save $30 – $40 dollars on the conversion. Before I go onto drilling the holes for the pass thru shanks, I will closed up the the existing holes. I taped a piece of card board to one side and used low expanding spray foam to close up the holes. (the foam used to insulate around windows. After the spray foam had set I used a steak knife and cut off the excess the flowed out of the hole and used clear epoxy to create a watertight seal and harden the holes. Now you’re ready to drill the holes. It is up to you where you drill them, but you should have them up high on the cooler wall so you won’t have leaks from melting ice. I drilled 4 1″ holes, one fore each tap line. I choose to have 2 pass through shanks on each side because I didn’t want the holes coming out the back since I sometimes use the box at events. 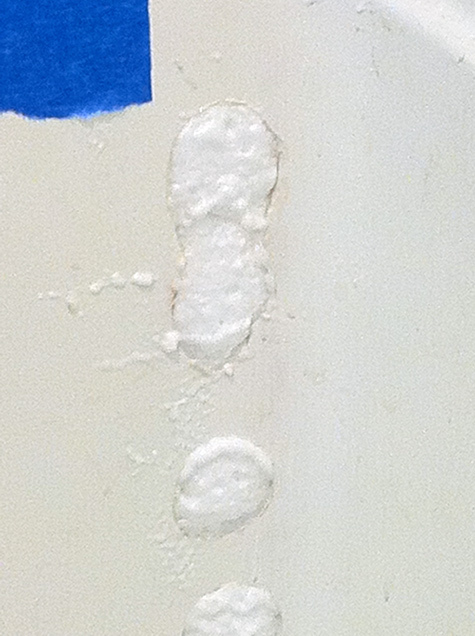 Be careful as you are drilling the hole, once you get through about a 1/16″ of plastic, there will be insulation. Go slowly through the insulation and it won’t turn into a big mess and you will also be able to see when you are going to go through the inside wall. Once you see the dimple of the drill bit coming through the inside wall, stop. Start the hole from the inside going back to the out side. This will give you nice clean edges on both sides of your hole. With all your holes drilled, you can insert the pass through shank in the hole. 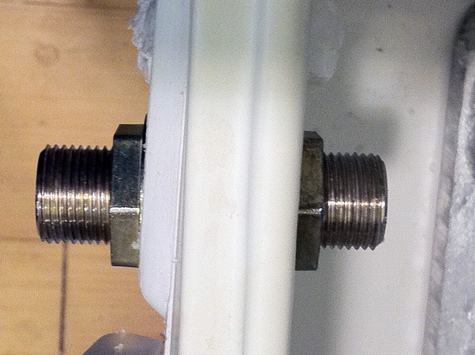 With the tightening nut on one side, adjust it until the shank is about centered in the cooler wall. With the other tightening nut hand tighten it. With the nuts on both sides of the shank hand tight, use the two plumber wrenches to completely tighten it. But, be careful not to tighten to much and crack the plastic. The plastic will bow in slightly, once you see that you can stop. 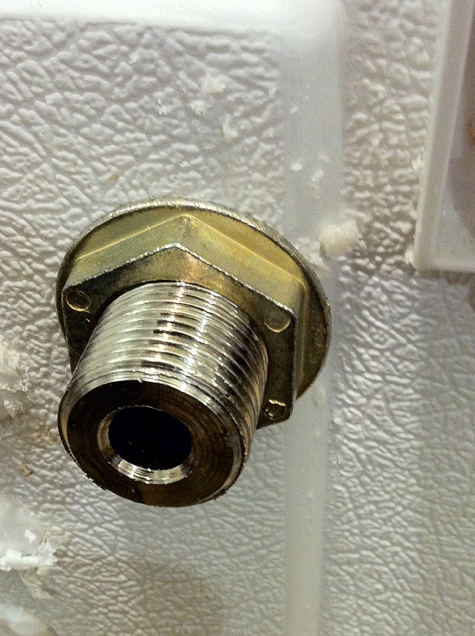 At this point you should have a foot or so of 3/16″ Beer line attached to the cold plate, as well as your taps shanks and pass though shanks through the cooler. Now place the cold plate into the cooler if it isn’t there already and trim the beer line tubing to line up with your shanks. 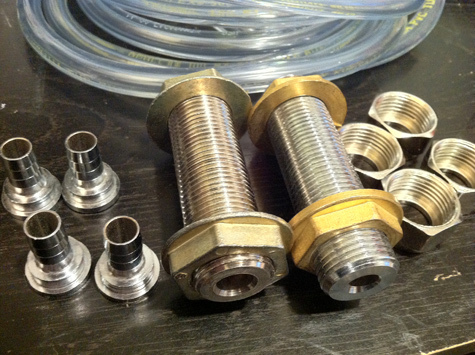 With your tubing trimmed, once again heat the beer line in boiling water and you be attaching a 3/8″ barb to each “IN” line. 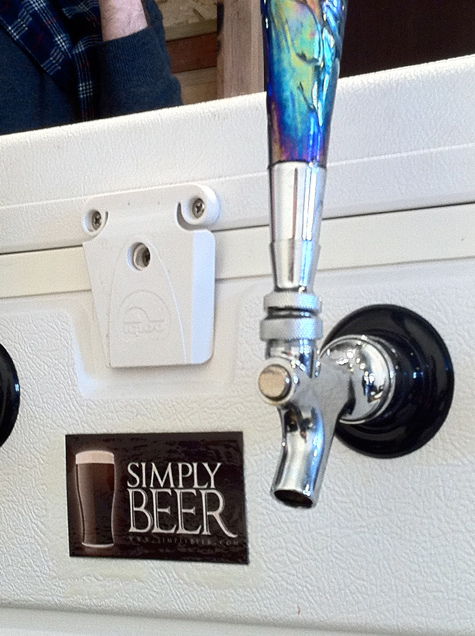 (In my cooler, the tap shanks have a barb.) Once the line is pliable, put the barb in the hex nut then a washer and hand tighten onto the shank. This will give you a firm base to finagle the beer line on the barb. It will also ensure you have the right length beer line. Once the beer line is attached, you can tighten with a plumbers wrench Repeat this for each line and also attach the tap shanks as well, using the same method of heating the tubing. At this point the insides of you jockey box is complete. But were not done yet, you still need the line from the out side of the pass through shank to your Beer vessel of choice, I use Ball Lock corney kegs, but this can be easily converted to pin lock or any other commercial keg tap. With the setup complete, make sure you don’t have any leaks. Since the beer line fits sublt on the barbs, if you are going to have leaks it will be where the barbs connect to the cold plate or shanks. 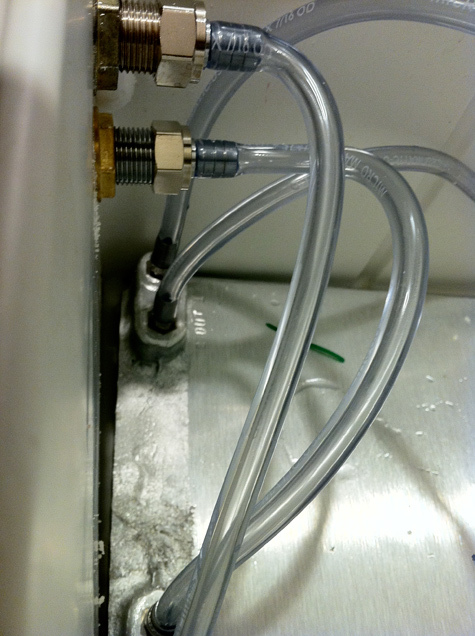 The washers should aleveate any leaks, but run BLC (Beverage Line Cleaner) through the system anyway. Besides identifying any leaks it will also clean you lines and plates.